Located in the Eastern part of the Southern region of Vietnam, Ho Chi Minh City-Dong Nai-Binh Duong together to form the Southern Key Economic Zone (with Ba Ria – Vung Tau, Binh Phuoc, Tay Ninh, Long An and Tien Giang province). Ho Chi Minh city is the big tourism center in Vietnam, attracting a large of visitors to Vietnam with various attractions as War Remnant Museum, Cu Chi Tunnels, Opera House, Ben Thanh Market, City Hall,…Meanwhile Binh Duong and Dong Nai is two of the provinces with rapid economic growth rate and dynamic industrial development of Vietnam. HCMC – Binh Duong – Dong Nai is lucky to own a specific mild climate, which is very suitable for Golf lovers, it’s the home of six wonderful golf courses. 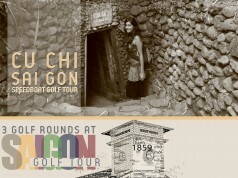 So, UniGolf has built the 3 days 2 nights golf tour with the top golf courses in the above 3 locations, which are also typical courses of Southern: Vietnam Golf & Country Club (HCMC), Long Thanh Golf Club (Dong Nai), Song Be Golf Resort (Binh Duong). These 3 golf rounds will satisfy the most fastidious golfers. At first, you’ll have a wonderful time experiencing at Vietnam Golf & Country Club. 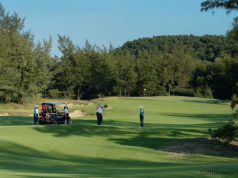 This 300-hectare 36-hole golf course has long been recognized as Vietnam’s premier golf club, and was twice voted Runner up as Asia best golf course. 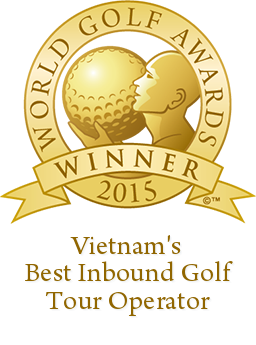 In 2011 VGCC received another great honor when it was voted as Vietnam’s best customer service golfing venue. It’s a great getaway from the crazy traffic as it only takes 25 minutes driving from the center. The 36-hole course is divided into two 18-hole courses: West and East Course. The West course measures 6,835 yards from the longest tee. The course winds its way through the trees offering challenging tee shots to the tree lined fairways before playing to the softly contoured Bermuda TifEagle greens, which provide beautiful putting surfaces all year round. The East Course measures 6,922 yards offers more generous fairways than the West Course but is protected by well positioned bunkers, water hazards and undulating Bermuda TifDwarf greens. The fairways are all nicely manicured and on the East Course, you can play it a bit more wide where the West Course is a bit tighter in the lay-out. A bit more water on the East Course which does pose a different problem. With regards to the greens, not a difficult choice, play the West Course as they are a lot more forgiving and a lot less undulating. 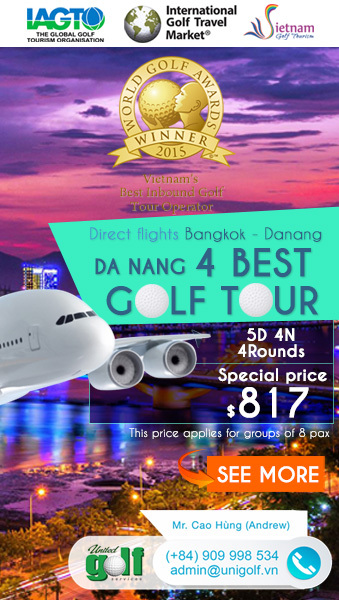 Long Thanh Golf Resort is one of the best golf courses in Vietnam which is wonderful for golf players who look for golf tours in Saigon. Situated in the southern economic triangle and 60 minutes from Ho Chi Minh City’s center, Long Thanh Golf course is located in an area of more than 350 hectares in Phuoc Tan, Long Thanh district, Dong Nai province. At the elevation of 36 meters above sea level and is surrounded by Dong Nai River, the 36-hole course is blessed with the fresh air, beautiful tropical landscape and a panoramic view that gives professional as well as amateur golfers the thrilling and exciting challenges. 36 holes of golf are divided into two rounds of 18 holes (Lake and Hill course). For leisure golf players, the Lake Course which measures 7109 yards is the perfect choice. It’s designed to offer great chance for all leisure golf players around the world. Long Thanh Golf Club has received many awards such as one of the best courses in Vietnam chosen by Asian golf Magazine in 2013; and second runner up best Golf Courses in Vietnam voted by Asia Pacific Golf Group in 2014. 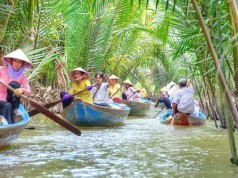 Situated in Lai Thieu, about 40-minute drive (20 km) from the center of Ho Chi Minh City. Well known for being is the first course which meets international standard, recognized by USGA and is widely regarded as one of the most challenging layouts in the country. Located on an area of 104 hectares, Song Be Golf Resort has been gently crafted out of the beautiful landscape and features 14 lakes, beautiful green fairways and subtle undulating greens. This new scene is ensured to create many attractions as well as setting new goals for you to conquer. The course now boasts 3 nine-hole courses: Lotus, Palm and Desert. For a resting place in HCMC, you will have 2 choices which are Royal Lotus hotel or Lavender Hotel. Lavender Hotel is located in the center of HCMC, near Ben Thanh market, Notre-Dame Cathedral and Opera House. All rooms are elegently designed with modern equipment, creates a warm feeling. The restaurant and Lavender Hotel Bar overlooks Ben Thanh market and the city center, attracts gourmets not only by its attentive services but also by the specialties of Vietnam and the West. Royal Lotus Hotel Saigon is a perfect choice for those who want to view and feel the scene of Ho Chi Minh. This 4-star hotel is located in a very convenient position, easy to access many popular area of the city. 173 rooms give you a warm and pleasant feeling like being at your home with high-end devices such as non-smoking room, access Wi-Fi internet, shower, tub, LCD/Plasma TV. Day 1: Car takes you from airport to Vietnam Golf & Country Club (HCMC) to play one golf round, then go back to the hotel for checking in (Royal Lotus or 4-star Lavender hotel). Freely relax through nightat hotel. Day 2: After breakfast at hotel, car takes you to Long Thanh Golf Club (Dong Nai) to play one golf round. When finish playing, car takes you back to the hotel. Day 3: After breakfast at hotel, car takes you to Song Be Golf Resort to play one golf round. The tour finishes, car takes you to the Airport. Keyword: Vietnam Golf & Country Club, Long Thanh Golf Club, Song Be Golf Resort.